The TripAdvisor Certificate of Excellence is awarded to establishments that regularly receive the best advice from travelers. A guarantee of quality, this award is awarded for one year by TripAdvisor. 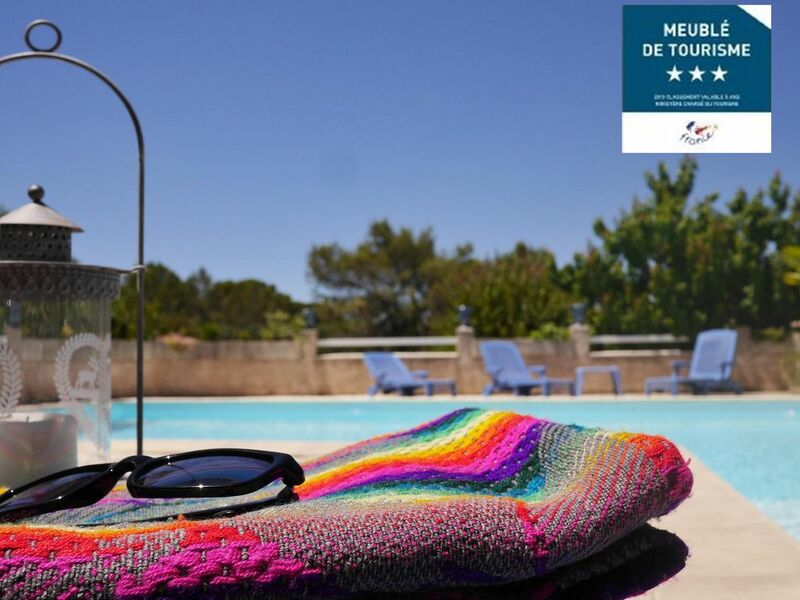 We are pleased to welcome you in a Clévacances (3 keys) classified accommodation and classified Meublé de Tourisme *** 5 km from the city center, on the heights of Nîmes, in full scrubland, in a quiet residential area, located between the Alès road and the road to Uzès. The wooded property of 3000m2 is fully fenced and private (not vis-à-vis). The swimming pool (10x5) with a drop off specially designed for the little ones, is surrounded by a relaxation area with its deckchairs where you can rest; one part is sunny and the other is shaded by the holm oaks. In the pool, are available, games for the pool, a shower and toilet. Date impoundment: June to October. The house of local style lavender blue shutters is situated on a hill, north of Nîmes, with wide view over the Cevennes. Spacious bungalow is designed all in length, divided into 3 independent spaces that follow one another; the owners and the other two rented in season, apartment apartment Lavender and Green Oak. Each is equipped and furnished for your comfort, has its own entrance and its own terrace (main openings on the South). Lavande *** (73m2) consists of 2 bedrooms, a toilet area with toilet, a bathroom with bath and toilet, a kitchen and a large living room / dining room. The master bedroom has a 1.60m bed for 2 people and its own toilet with toilet space. The kitchen is fully equipped with all kitchen utensils and crockery you need. The living / dining room is a spacious bright room with a large window that gives the pool side terrace. The private terrace has its own garden furniture and barbecue. Pool view. Green oak *** (60m2) has 2 bedrooms, a separate toilet, a bathroom with bath and a kitchen area in a large living room / dining room. The master bedroom has a bed of 1.60 m and the second bedroom has two separate single beds. The living / dining room has a large bay window that overlooks the spacious terrace, private and shady, with its own garden furniture. Nature view. All linen is provided (towels, bath towels, linens for bed, tea towels). Beauty and cosmetics available at home, on request by qualified beautician; a true moment of relaxation and well-being! English, Spanish and Swedish spoken. The lodging CHENE GREEN (60m2) Furnished 3 * Tourism The apartment has two bedrooms, a toilet, a bathroom with bath and a kitchen area in a large living room / dining room. The master bedroom has a bed of 1.60 m and the second bedroom has 2 single beds. The kitchen is fully equipped with all kitchen utensils and dishes you will need. The living / dining room has a large bay window that overlooks the spacious terrace, private and shady, with its own garden furniture and garden views ..
Sommerurlaub mit Ruhe und Erholung pur! Sehr herzlicher Empfang durch die Vermieter, die uns jederzeit mit Rat und Tat zur Verfügung standen. Anne-Christine spricht sehr gut Englisch, was bei unseren eingerosteten Französischkenntnissen sehr hilfreich war. Wir hatten die Wohnung Lavande gemietet, wenige Schritte zum sehr gepflegten Pool, herrlich schattige Terrasse. Wohnung ist ausreichend ausgestattet, wir haben nur Fliegengitter an den Fenstern in den Schlafräumen vermisst. Das Haus liegt ziemlich weit vom Zentrum von Nimes und von allen Einkaufsmöglichkeiten entfernt. Mal schnell ein frisches Baguette am Morgen zu holen geht leider nur mit dem Auto. Immerhin war ein Bouleplatz zu Fuß zu erreichen. Abenteuerlich enge Straßen, unendlich viele Einbahnstraßen mit schlechter Beschilderung, als nicht Ortskundige brauchten wir oft viel Zeit um aus der Stadt herauszukommen. Insgesamt aber ein schöner Urlaub mit hohem Erholungsfaktor und vielen interessanten Ausflugsmöglichkeiten in der Umgebung. Vielen Dank nochmals an Anne-Christine und Jacky für die freundliche Betreuung. "Thank you very much, Herta, for taking the time to describe your experience in Nîmes ! We look forward to having you back if you decide to come to Southern France again !" Nous avons apprécié notre séjour trop court malheureusement. La location est idéalement située, sur les hauteurs de la ville, au calme. C'est un très beau logement, décoré avec goût, très propre. Les propriétaires sont d'une grande gentillesse, à l'écoute de leurs locataires et d'une grande disponibilité. Nous ne manquerons pas de vous recommander à nos amis et nous espérons y revenir pour du tourisme cette fois-ci. Notre séjour professionnel s'est bien déroulé : le logement est bien équipé et bien entretenu, l'espace est fonctionnel. La propriétaire s'est montrée pleine d'entrain et de bons plans, comme les Halles où on peut manger tous les midis, excellent ! Au plaisir de vous accueillir de nouveau à Nîmes peut-être lors de congés personnels. Le logement bien équipé est situé sur les hauteurs de Nîmes dans un endroit très calme et bucolique. Il est préférable d'avoir une voiture pour s'y rendre. La propriétaire est très accueillante et donne de nombreux conseils pratiques très utiles. Au plaisir de vous revoir aux Capitelles lors d'un prochain séjour dans le sud-est de la France ! Gîte très agréable au milieu de la garrigue nîmoise. L'accueil des propriétaires est excellent. Le soleil, la piscine, la quiétude ont été au rendez-vous de ces vacances. Seules les petites routes sinueuses et étroites pour se rendre au gîte peuvent sembler difficiles après une journée de visite. bonne semaine sur les hauteurs de Nîmes! Nous sommes enchantés que vous soyez repartis ravis de vos vacances et nous serions très heureux de vous accueillir à Nîmes lors de prochaines vacances dans le sud-est de la France. NIMES, a UNESCO World Heritage candidate, is located on the edge of the hills, the scrubland, the plain and the Petite-Camargue in the Languedoc of the East (45 km from the Mediterranean and 60 km from the Cevennes). Distances from Nimes to some of the most beautiful sites in the region. POUR LA RESERVATION Contrat de location (en 2 exemplaires) + plans d'accès à la propriété + brochure de Nîmes (si souhaitée) vous sont envoyés par courrier postal. Dépôt de garantie : prix d'une semaine de location ( chèque non encaissé et restitué au moment du départ). Option ménage si souhaitée : 50 Euros FOR YOUR RESERVATION A rental contrat + maps to get to the proerty + a brochure of Nimes (il you wish) will be sent to you. Damage deposit :equivalent to one week's rental. Will be returned to you on departure. Cleaning option (if you wish) : 50 Euros.